Risk factors for poor wound healing include smoking, peripheral vascular disease, poorly controlled diabetes, steroid use, immunocompromised states, obesity, Ehlers-Danlos syndrome, cutis laxa, pseudoxanthoma elasticum, and poor nutrition. If there is concern for a nonradiopaque foreign body in the wound, consider soft-tissue ultrasound. Clean the wound with 50 mL to 100 mL of irrigation solution per cm of laceration length to clear all debris from the wound. Pressure of 5 to 8 psi is strong enough to overcome the adhesive forces of bacteria. 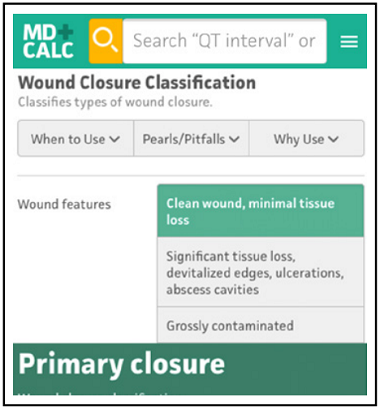 The Wound Closure Classification stratifies types of wounds to help guide strategies for closure. The types of wound closures are clearly described; however, patient-specific characteristics such as risk factors and nutritional status, in addition to the quality of the wound itself, will make every clinical scenario different. Surgeon experience and judgment often dictate the type and timing of closure. The Wound Closure Classification has limited application in abdominal and orthopedic wounds. Multiple studies with varying levels of evidence have compared primary versus delayed primary closure of contaminated or infected abdominal wounds and of traumatic open orthopedic wounds in the context of reducing surgical site infections. No definitive evidence based consensus currently exists on the optimal time of primary skin closure for either abdominal or orthopedic wounds. Wound closure types are categorized into primary, secondary, or tertiary. Primary closure is healing by primary or first intention in clean wounds with minimal tissue loss that are amenable to approximation of wound edges. Primary closure is ideally performed within 6 to 8 hours of trauma, but wounds in vascular areas may be delayed to up to 24 hours after trauma. Secondary closure is healing by secondary or second intent. The wound is left open to heal largely by the formation of granulation tissue and contraction. These wounds often have significant tissue loss precluding tension-free approximation of edges, with devitalized edges, ulcerations, or abscess cavities. Wound dressings are changed at least daily to aid in the formation of granulation tissue and subsequent contraction. Tertiary closure, also known as delayed primary closure, is healing by tertiary or third intention. The decision is made to perform a delayed closure of a wound after a variable period of time for which the wound has been left open. These wounds are grossly contaminated but do not have significant tissue loss, and can potentially be closed after the wound is thoroughly explored, irrigated, debrided, and observed for 3 to 7 days before surgical closure or skin grafting. The closure of these wounds can potentially be expedited with negative-pressure vacuum therapy (Kugler 2016, Vargo 2012, Kaushik 2017, Cherubino 2017). The type and timing of wound closure in traumatic or contaminated wounds plays a role in the incidence of surgical site infections. Surgical site infections are a source of significant morbidity to the patient and result in increased health care costs. Use the wound closure classification for patients with open wounds that require closure, particularly wounds from trauma. The type of wound closure will differ depending on the wound etiology and pattern of injury, morphology, contamination classification, and complexity. Management will depend on the diagnosed pathology or injury, and wound closure will differ depending on the clinical scenario, as previously mentioned. In 2013, Bhangu et al performed a systematic review and meta-analysis of 8 randomized control trials (RCTs) comparing primary versus delayed primary skin closure in specifically contaminated (United States Centers for Disease Control and Prevention’s National Healthcare Safety Network wound class III) and dirty/infected (United States Centers for Disease Control and Prevention’s National Healthcare Safety Network wound class IV) abdominal incisions. The review concluded that DPC may represent a simple, reliable, and potentially cost-effective method of reducing surgical site infections (SSI), but the analysis was inconclusive due to the poor study designs, high risk of bias, and clinical heterogeneity. The RCTs included 623 patients with various abdominal wounds: post-appendectomy, repair of perforated hollow-viscus injury, ileostomy closure, trauma, and intra-abdominal abscess or other peritonitis. The RCTs had varying time to review for DPC patients (2 to 5 days postoperatively), criteria to continue DPC, and definitions of wound infection. The review noted a high rate of heterogeneity (77%) between the study designs of the RCTs. When controlling for the heterogeneity, the risk of SSI was reduced in patients with DPC (odds ratio, 0.65; 95% confidence interval, 0.40-0.93; P = .02; fixed-effect model analysis). However, when accounting for the heterogeneity, the risk of SSI in DPC patients was no longer significant (odds ratio, 0.65; 95% confidence interval, 0.25- 1.64, P = .36; random-effect model analysis). Benson et al’s double-blind prospective study of 82 open fractures found no increased risk of infection when wound closure was delayed for 5 days postoperatively in highly contaminated fractures while patients were receiving prophylactic antibiotics. Gopal et al retrospectively reviewed 84 patients with Gustilo Type IIIB (extensive soft tissue damage with inadequate coverage) and IIIC (arterial injury requiring repair) open tibia fractures who underwent debridement, fracture fixation, and vascularized muscle flap either within or 72 hours after injury (early vs delayed). The study concluded that the low rates of infections in the early fracture fixation and flap coverage group supported the concept that delayed coverage was not necessary if healthy soft tissue can be imported reliably into the zone of injury. The review concluded that questions persist regarding PC versus DPC of open fractures. Of note, the American College of Surgeons Trauma Quality Improvement Program (ACS TQIP®) guidelines, which are based on expert opinions, recommend that when possible, skin defects overlying open fractures should be closed at the time of initial debridement. For open fractures associated with wounds requiring coverage with skin grafting or soft tissue transfers (in other words, Gustilo Type IIIB), it is recommended that coverage be completed within 7 days from the time of the injury. Kumar S, Leaper DJ. Classification and management of acute wounds. Surgery (Oxford). 2005 23(2):47-51. American College of Surgeons Committee on Trauma, Orthopedic Trauma Association. ACS TQIP Best practices in the management of orthopedic trauma. Available at: https://www.facs.org/quality-programs/trauma/tqip/best-practice. Accessed November 24, 2017. Bhangu A, Singh P, Lundy J, et al. Systematic review and meta-analysis of randomized clinical trials comparing primary vs delayed primary skin closure in contaminated and dirty abdominal incisions. JAMA Surg. 2013;148(8):779-786. Halawi MJ, Morwood MP. Acute management of open fractures: an evidence-based review. Orthopedics. 2015;38(11):e1025-1033. Benson DR, Riggins RS, Lawrence RM, et al. Treatment of open fractures: a prospective study. J Trauma. 1983;23(1):25-30. Gopal S, Majumder S, Batchelor AG, et al. Fix and flap: the radical orthopaedic and plastic treatment of severe open fractures of the tibia. J Bone Joint Surg Br. 2000:82(7):959-966. Vargo D. Negative pressure wound therapy in the prevention of wound infection in high risk abdominal wound closures. Am J Surg. 2012;204(6):1021-1023. Kaushik D, Joshi N, Kumar R, et al. Negative pressure wound therapy versus gauze dressings for the treatment of contaminated traumatic wounds. J Wound Care. 2017;26(10):600-606. Cherubino M, Valdatta L, Tos P, et al. Role of negative pressure therapy as damage control in soft tissue reconstruction for open tibial fractures. J Reconstr Microsurg. 2017;33(S 01):S08-S13. Semer NB. Secondary wound closure. In: Practical Plastic Surgery for Nonsurgeons. New York, NY: Authors Choice Press; 2007: Chapter 10. Recognize the etiologies of wounds presenting to the emergency department. Describe the steps for initial evaluation of wounds in the pediatric population. Appropriately manage wounds in pediatric patients. Recognize risk factors for wound repair complications and poor outcomes. Date of Original Release: October 1, 2017. Date of most recent review: September 15, 2017. Termination date: October 1, 2020. Other Specialty CME: Included as part of the 4 credits, this CME activity is eligible for 4 Trauma CME, 1 Pain Management CME, 0.25 Infectious Disease CME, and 0.5 Pharmacology CME credits, subject to your state and institutional requirements. Faculty Disclosure: It is the policy of EB Medicine to ensure objectivity, balance, independence, transparency, and scientific rigor in all CME-sponsored educational activities. All faculty participating in the planning or implementation of a sponsored activity are expected to disclose to the audience any relevant financial relationships and to assist in resolving any conflict of interest that may arise from the relationship. Presenters must also make a meaningful disclosure to the audience of their discussions of unlabeled or unapproved drugs or devices. In compliance with all ACCME Essentials, Standards, and Guidelines, all faculty for this CME activity were asked to complete a full disclosure statement. The information received is as follows: Dr. Sanders, Dr. LoTempio, Dr. Sass, Dr. Claudius, Dr. Nordt, and their related parties report no significant financial interest or other relationship with the manufacturer(s) of any commercial product(s) discussed in this educational presentation. Dr. Jagoda made the following disclosures: Consultant, Daiichi Sankyo Inc; Consultant, Pfizer Inc; Consultant, Banyan Biomarkers Inc; Consulting fees, EB Medicine.